gets 70 mpg, Vespa is offering to provide you with a free $5 SUBWAY® card. Visit any Piaggio Vespa dealer, take a test ride or ask a sales person to discuss the features and benefits of a Piaggio or Vespa scooter and you will receive a FREE $5 SUBWAY® card, redeemable at more that 21,000 SUBWAY® restaurants in the U.S.
with a FREE $5 SUBWAY® card! Offer valid June 2–August 10, 2008 and while supplies last. Actual card image may vary. of companies. Motion Picture Artwork and Photography © 2008 Warner Bros. Entertainment Inc.
SUBWAY® is a registered trademark of Doctor's Associates Inc. 2008 Doctor's Associates Inc. All rights reserved. old to participate. Valid at participating Vespa Piaggio dealers. What is the SUBWAY® Card Program? 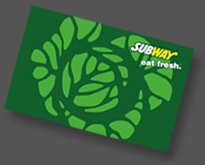 www.mysubwaycard.com for further details about using your SUBWAY® Card.